Due to an increase in engineering costs an additional 50K has to be raised before they will begin production. 25k has been spent on development of the Pentarasus to date. 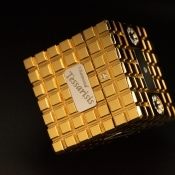 There will be a delay on Pentarasus until the additional funding has been raised, a few options are available and further updates will follow soon. The fifth puzzle, Pentarasus will only be available to members who own unlocked puzzles of the first 4 puzzles in the series. Sneak Preview link. Click here. The Adventure Puzzle series is now in its 11th year of development with all 5 of the 5 unique puzzles available this year. All of our Adventure puzzles are designed and manufacture in-house in the UK and we sell to more than 35 countries. The online Adventure which compliments the puzzles grows from strength to strength with many of you winning great prizes during your quest. The Adventure code book is also a perfect companion for anyone that is looking for hints and clues to complete their puzzle and now each book contains a guaranteed winning scratch card. * We ship to any country in the world using Fedex Priority shipping, often your order will arrive within 3 days.